Evo Aerolight is our fastest hi-performance oriented jersey of all our range. This jersey will be especially suitable for hot weather or when you want to be fastest thanks to the materials used and the low collar. Evo Aerolight Midnight Rider men’s cycling jersey is our fastest jersey of them all. It’s not only a new name, but it’s also a new cutting and technologies! We developed these jerseys over several seasons. Therefore the Evo line is our hi-performance oriented. Carefully selected materials, the perfectly worked cutting and proven fittings ensure a very comfortable use of Evo Aerolight Midnight Rider men’s cycling jersey. Our main goal in designing the jersey was to maximize aerodynamic benefits without sacrificing riders’ comfort. This jersey will be especially suitable for hot weather or when you want to be fastest thanks to the materials used and the low collar. It stops UV rays and is hydrophilic. We made the front of the jersey of ultra-light and soft 4-way stretch lycra with the longitudinal structure to improve aerodynamics and air permeability. 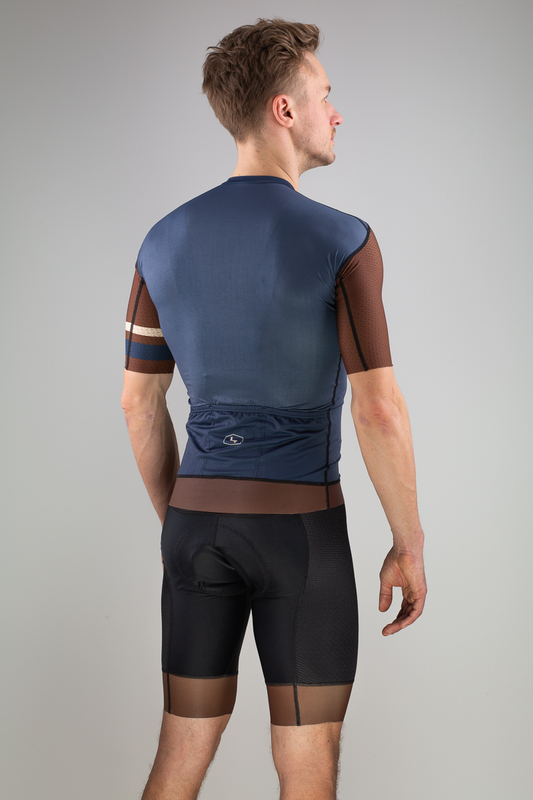 The back of the jersey is a very lightweight micromesh material that provides extremely fast moisture outlet. The jersey’s hand is of lycra with longitudinal structure. We improved the lycra in the wind tunnel. So it helps to reduce air resistance. During the development of this collection, we have devoted a lot of research and testing on aerodynamics to offer the most effective solution and we are 100% confident that these products will help to show your best results, not hinder you from. To see cutting and fabrics, check out all the pictures!